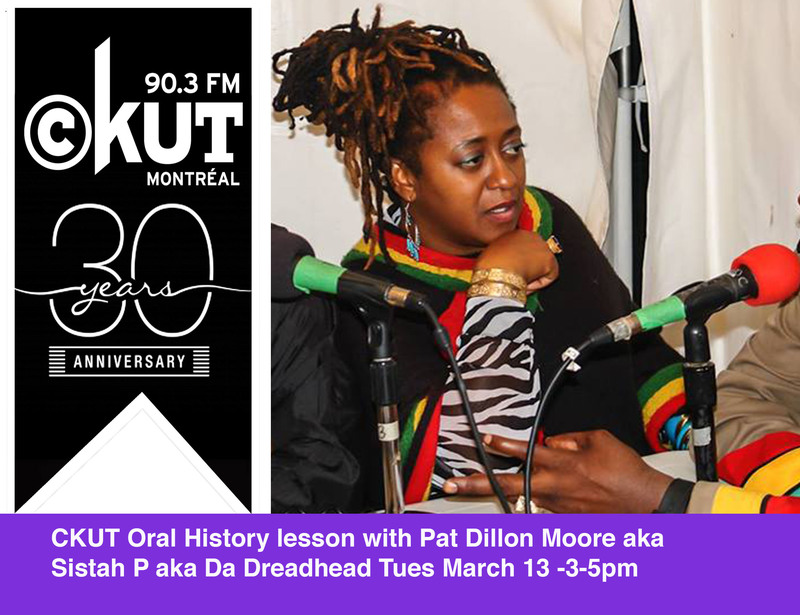 March 13th Episode Two of the Montreal Sessions Time Capsule Edition is a in depth interview with Ms. Pat Dillon Moore aka The Dreadhead aka The Empress aka Sistah P. Former host of Positive Vibes, former Station Manager of CKUT (yes, we used to have one of those) and current co host of Bhum Bhum Time alongside Angel, Storm and JD. She will dish on growing up in Montreal, her relationship with Reggae music - the many many stories she has to tell about her experiences at CKUT, the laughs and the fights. Tune in Tuesday 3pm - 5pm or catch it on the archives. Tune into the The Montreal Sessions throughout March for a peak into CKUT’s Time Capsule. March 6th will kick off the month with an interview with Joan La Barbara, a great clip of who’s staying up at night with Roots Rock Reggae, a Sun Ra interview, a history of Margo Lane, bits of Rickey D›s fascinating oral history, and a spicy clip from Off The Hook which we had to shelve for a few years because it was too hot to re-air originally. Listen live Tuesdays, 3-5pm or download the episodes afterwards at the bottom of this page.